It seems every recipe includes a generous amount of kale, that leafy uber-vegetable that shows lettuce once and for all who’s the new kid in town. 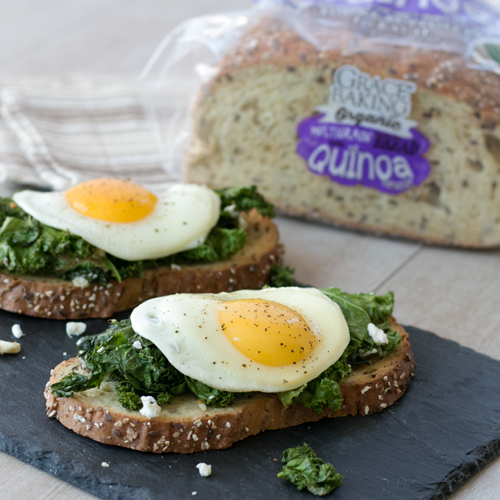 If we had you at kale, then the eggs, feta cheese, zingy red pepper flakes and garlic will have you drooling. Of course it’s our Organic Multigrain with Quinoa that seals deal. When these little gems begin heating up in a perfect little puddle of olive oil on a hot skillet your nose is going to insist on a seat at the table, but bring your entire self along, your mouth and taste buds will thank you for it. Heat 2 teaspoons of olive oil in a large skillet, over medium heat. Add kale and sauté, stirring often, until kale is cooked (approximately 5 minutes). Add garlic, salt, pepper and red pepper flakes and stir for 1 minute. Remove from heat and add Feta cheese. In a small skillet, heat the remaining teaspoon of olive oil and fry an egg to your liking. Top toast with kale mixture and egg.